« Today’s Dining: Dazzle or Casual? Gone are the days when furniture buying meant you had to purchase “sets.” Today’s homes are all about reflecting our own personalities, and there’s no rule that says everything in a room has to match! The dining room is an excellent space to show off some personality and style, from the furniture you choose to the table settings you use. Maybe you’ve found that when you shop for a dining room set, you find a dining table you like, but you don’t like the chairs that go with it, or vice versa. Or, maybe you love the buffet or sideboard in the set, but not the table or chairs. Don’t worry! You should love every piece of furniture you buy, so don’t be afraid to mix and match the pieces you like to get the look you want. Dining room tables are manufactured in several shapes, styles and materials, so first consider how you are using the room. Do you want the room to feel more formal or use it as an everyday, casual dining area? Dark wood finishes tend to add more formality to a dining group, while light finishes, painted finishes and glass tabletops create a more casual feel. Also consider shape: is your space or room long enough for a full rectangular table, or would a square or round table work better? Many tables come with leaves to extend the table size for special occasions, but consider how the table will be used most frequently. Ideally, you want to have at least four feet of space around the table to be about to pull out chairs and get around the table comfortably while people are seated. For more casual dining spaces, you might also consider “gathering height” tables, which are simply tall tables that use barstools or counter-height chairs. 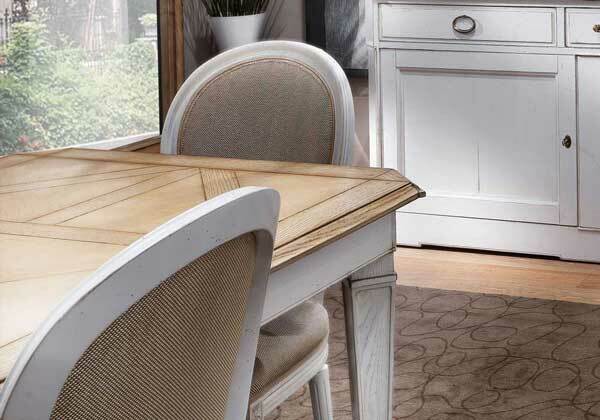 Even in a formal dining room, the chairs don’t all have to be the same. If you have a rectangle table with eight chairs, consider getting different chairs for the two end chairs, three side chairs in X-back style, and the last three in a simple microsuede fabric – then stagger the styles around the table. Or, if you have a round pedestal table with four chairs, you might place two leather armchairs across from each other and two upholstered chairs opposite each other. For formal rooms, you may want to stick with the same general wood finish or color for the chair legs to tie them together, but don’t worry if the wood finishes on the furniture don’t match – just blend them with some pattern or symmetry and they will work. Casual spaces allow even more freedom. Instead of pairing wooden chairs with your casual wood table, try using a couple of rattan chairs to add an earthy and natural element to the room. Or if you want to play up your retro style, scout out some flea markets or antique shops for a few vintage chairs – they may look completely different but they’ll provide a great nostalgic element to your breakfast nook. You might even add a bench to one side of the table and have chairs on the other for a fun, outdoorsy feel. Side note: if you’re mixing chairs, don’t forget to measure the height of the seat – you’ll want all your chairs to sit at the same height as each other, as well as be the correct height for the table you have. Sideboards, china cabinets and buffet tables are great ways to add lots more personality to the room. Consider a completely different material and style for this piece – for example, if your table and chairs are mostly dark mahogany, maybe you could add some sparkle and glamour with a silver, mirrored china cabinet. Or you might consider a painted sideboard to add a bold splash of color in the room. To pull the room together, add a colorful area rug underneath the table, and use some of those colors in your curtains and to decorate the table with candles, vases, or even a simple bowl of fruit. Don’t feel like you’re stuck buying a “set” of furniture if you don’t like all of it! Pick the pieces you like and add to them. Let your room design reflect your creativity and personality – you will enjoy it much more if you do!